Massive sound in a road-ready 4x12 cab. The IRT412 custom-designed guitar cabinet is constructed from rugged plywood and loaded with four custom 12-in. HH drivers handling 320 watts. Forged deep in the Black Country, the Ironheart series continues the legacy begun decades before with amps such as the Laney KLIPP and AOR. Packed full of features, amazing tone and a thoroughly modern and rugged look, the Ironheart Cabinet models compliment any amplifier. Designed and engineered in the Black Country, Great Britain, the IRONHEART IRT412 is a standard-sized guitar cabinet loaded with 4x12 HH drivers designed to deliver punch and clarity when used with any amplifier. 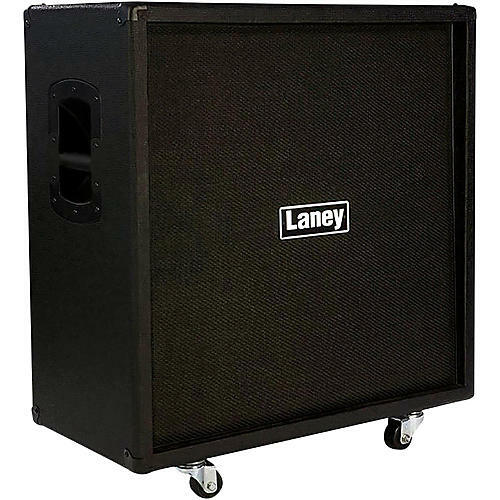 Constructed from rugged plywood the IRT412 is finished with black metal corners, black textured front fret, black basket weave Tolex, steel castors and comfortable side mounted bar handles the IRT412 cabinet is designed to survive a life on the road for years to come.